I’ve been limping along with my little 128 GB SSD drive on my MacBook Pro. (That statement still seems odd to me considering that my first hard drive upgrade, ages ago, was to a 30 MB hard drive that my sister told me I’d never be able to fill.) My kind boss felt sorry for me and sprang for a new, roomy drive. 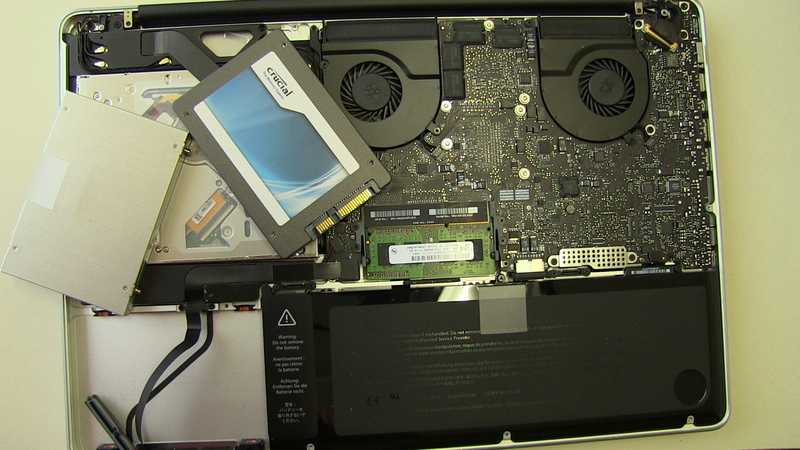 I received my new 500 GB SSD drive and went straight to swapping hard drives, which was incredibly easy. The steps I took were: 1. made sure my backups were current, 2. swapped hard drives, 3. restored my OS using Time Machine, 4. reinstalled my Windows Boot Camp using Winclone and then 5. checked to make sure everything was working. I have an external drive plugged in, so backups are updated every hour. I verified that mine was only a few minutes old, then checked on my external drive for a current Winclone backup of Windows running on Boot Camp and then verified that I had an up-to-date backup with CrashPlan, ’cause I’m just that paranoid. 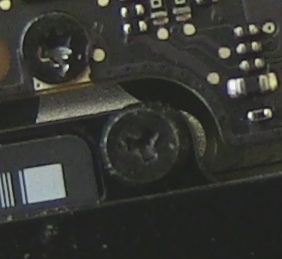 I use ifixit.com for things like this, they have nice step-by-step instructions, complete with pictures. For my laptop, I used this guide, http://www.fixit.com. The oddest thing I ran across was the bizarre screws (Tri-wing Y1 screws) used to attach the battery, I’ve never seen them anywhere before. Even my cool little screwdriver with combo phillips #00 and T6 torx bits doesn’t have that. Moving slowly and being careful not to touch the motherboard (since I couldn’t remove the battery), it still only took me about 10 minutes to swap the drives. This part is super easy, only made difficult by the fact that we have 4 different MacBook Pros in our office and, apparently, they each have their own distinct install disc. Yes, this could have been made a non-issue by taking 10 seconds to use a sharpie and write some comments on each disc. Since we didn’t do that, I grabbed what I thought was the most logical disk to use. 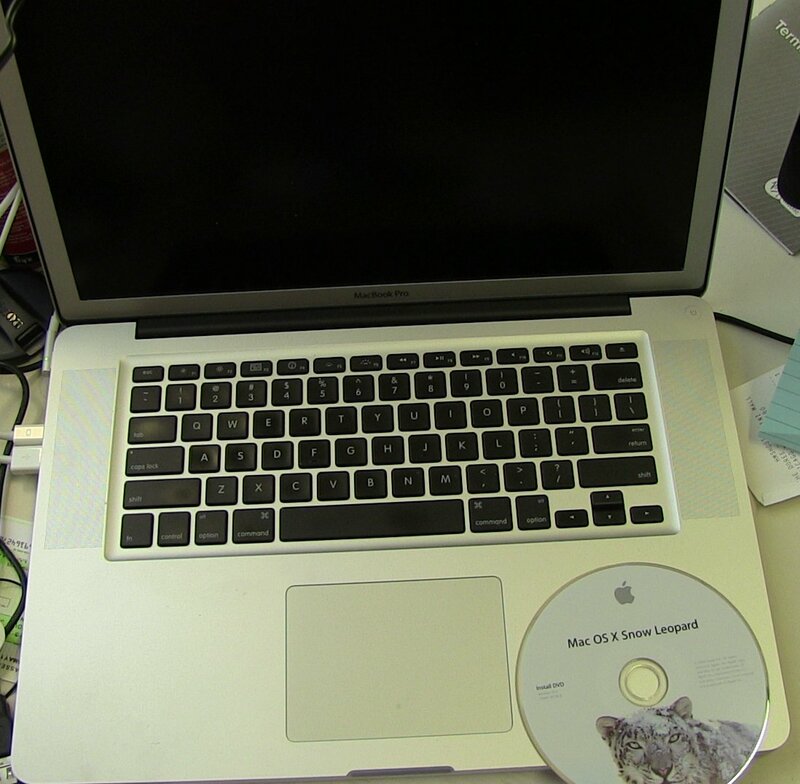 Silly me, thinking I could just use a Snow Leopard disc. I did learn a new way to eject discs; when Command-E and the eject button don’t work, you can push the track-pad button while rebooting. Turns out that rather than saying “this is the wrong disc, idiot”, Mac simply decides to keep the disc and not allow normal eject methods to work. Kind of like what a London bank ATM did with my bank card after one failed PIN attempt. Nice. So, after finding my specific Mac OS X install disc, I did a boot to the disc, chose ‘Restore System from Backup’ from the Utilities menu, selected the backup volume and the Time Machine backup I wished to restore to (most recent). It says 2 and a half hours in the picture above, but it turned out to only take about an hour and a half. While this churned away, I got started on an all day patch extravaganza of our new HP Windows 7 laptop (for the new sales guy). I would have been done at this point, except that my Windows install uses Boot Camp. I’ve been a fan of Winclone for a couple of years now, though it turns out they stopped development and decommissioned their website! I understand someone has released an unofficial copy of Winclone 2.3, which is supposed to support Lion (I believe you can just edit the appropriate plist file to ignore the version check if you want to continue using Winclone 2.2). See my side rant below. To restore Windows, I opened the Boot Camp Assistant, told it I have the Mac OS X install disc, then chose Create or remove a Windows partition, and then set the partition size to 40 GB. I did not format the drive, as Winclone will do this for me. 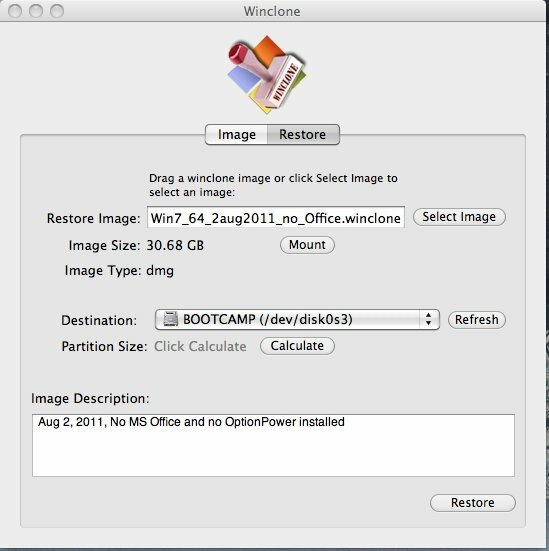 I’ve used Winclone before when increasing the size of my Boot Camp partition. 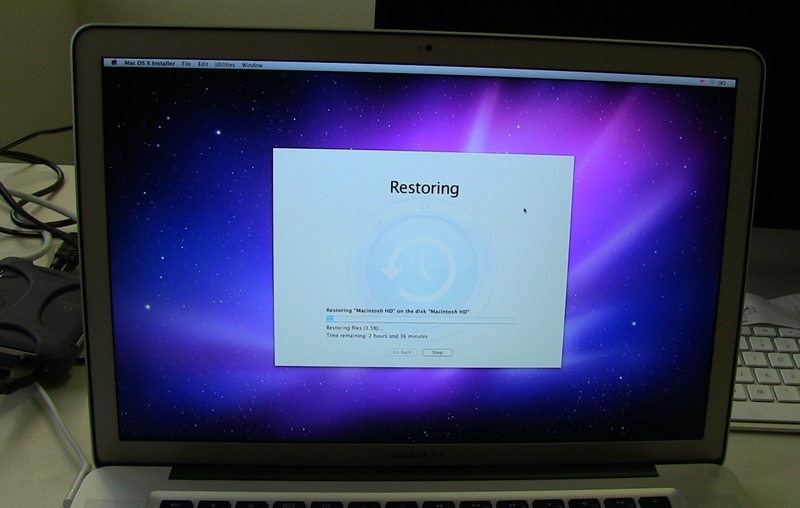 I simply blew away the partition with Boot Camp Assistant, increased the size, and then restored using Winclone. I did the same thing here with my hard drive swap. To perform the restore, you choose the restore tab, pick the backup file to restore to and choose the Boot Camp partition as the destination, unless you really want to repeat step 3 above. I must have been snoozing or something, because I had no idea the developers of Winclone over at twocanoes.com were in trouble or were even considering abandoning Winclone, which they did sometime in 2010. However sad that may be, why in the world did they just dump it? Seems like it would have been just as easy for them to move it to source forge and turn it over to someone else. I’m not aware of any program that replaces it, so it’s not like they gave up due to the competition. So, my rant? If you’re going to stop developing a free product that lots of people use, at least put it up on source forge and ask someone to take it over. For me, moving forward, I figure it’s just as easy to simply dd the partition to an external drive. That could even be scripted and run from cron. Hmm, if only there were some site that would discuss how to do things like that, such as backupcentral.com (this link points to an online version of the Linux and Windows Bare Metal Restore chapter I wrote in W. Curtis Preston’s book, Backup & Recovery). It should be pretty obvious if the restore succeeded or not. If things are all wonky and restoring to a different backup in Time Machine doesn’t work, then you will be stuck with a re-install of the OS, followed by restoring data from a backup (maybe the file restores will work from Time Machine or maybe you have another product grabbing files, like I do with CrashPlan). For me, everything was working fine, except for a couple of things, one of which is minor, the other turned out to be a non-issue. One was Microsoft Office and the other was my Parallels version of Windows. Microsoft Office had two issues, a database index that it said it needed to rebuild, and a prompt requiring me to re-enter my product key. Both of these were pretty minor, though still unexpected. The other issue was Parallels. I use Parallels to run my Boot Camp version of Windows as a virtual machine while running Mac OS. However, after my recovery, there was no Parallels applications folder in my dock and the pvm file was missing to start-up the virtual machine. There is an option within Parallels that says “Don’t backup with Time Machine” and I’m pretty sure I checked that way back when I set this up, since I’m using Winclone. However, I’m not sure of that, and it’s not the default. So, I simply went to CrashPlan to restore the pvm file, but discovered that it was 30+GB, which didn’t make sense, since it should just be a small file around 25 MB pointing to the Boot Camp location. All I did was start-up Parallels, choose “New” and point it to the Boot Camp Partition, then I was back in business.